New York, 3 March 2016– As the world marks the third World Wildlife Day under the theme “The future of wildlife is in our hands”, the United Nations announced today plans for a Global Coalition campaign to end the illegal trade in wildlife. UN Secretary-General Ban Ki-moon has called on UN agencies, CITES and partners to provide a coordinated response to wildlife crime and spread the message that there should be zero tolerance for poaching. "Time is running out to save some of the world’s most iconic species," he said. "Much more needs to be done by key actors on all continents and across sectors to combat poaching and address both the demand and supply of illegal wildlife products." Driven by growing demand for illegally sourced wildlife products, the illicit trade has in recent years escalated into a global environmental crisis, pushing several species to the brink of extinction. It is estimated that rhino poaching in South Africa has increased by as much as 8,000 per cent between 2007 and 2014. The pangolin, also known as the scaly anteater, is considered to be the most trafficked mammal on earth, with over a million animals taken from the wild in the past decade. Trade in live great apes, such as chimpanzees, gorillas and orangutans, is also of concern, especially as for every live animal illegally taken from the wild there are many more killed during capture and transport. The global effort to end illegal trade in wildlife received a boost last year, as the UN General Assembly adopted a resolution urging member states to classify illicit trafficking in wildlife as a serious criminal offence. This year, the UN calls for strong political commitments to be put into action through collective efforts of governments and citizens around the world. The Convention on International Trade in Endangered Species of Wild Fauna and Flora (CITES) has made substantial progress to combat illegal trade in ivory through the preparation, implementation and review of National Ivory Action Plans by 19 key countries affected by the illicit trade. In May 2015, the cross-continent Operation Cobra III brought together enforcement agencies from range, transit and destination countries, resulting in 139 arrests and more than 247 seizures, which included elephant ivory, medicinal plants, rhino horns, pangolins and many more. But more remains to be done. According to the latest analysis of illegal killing of elephants for 2015 released today by the CITES Secretariat, the overall poaching levels of African elephants remains alarmingly high. The Global Coalition campaign announced today is a joint effort by the UN Environment Programme (UNEP), the UN Development Programme (UNDP), the UN Office on Drugs and Crime (UNODC), CITES and other partners. The campaign will call on individuals, businesses, civil society and academia to use their spheres of influence to end the illicit trade in wildlife and for governments to meet and scale up their recent commitments. Global celebration of World Wildlife Day in New York also saw the announcement of the winners of the International Elephant Film Festival, selected from over 250 entries in 7 categories. Supporting the day's sub-theme “The future of elephants is in our hands”, the winning movies will be screened around the world throughout 2016. Poaching and the illegal trade in wildlife have reached unprecedented levels. As few as 3,200 tigers exist in the wild today. In the last few years, over 100,000 elephants were poached in Africa. Some rhino populations face extinction. The disappearance of individual species threatens biodiversity, and by extension the life support systems on our planet. Our responsibility is to look after wildlife. World Wildlife Day is a call to become more informed and more involved in stopping this crime against nature, communities and future generations. "World Wildlife Day is both an opportunity to celebrate wildlife biodiversity and a strong reminder that the illegal trade in wildlife is devastating iconic species. This vile trade threatens human security, community well-being, economic development, and environmental integrity. UNDP and its partners are committed to stopping wildlife poaching and trafficking." "An integrated approach against wildlife and forest crime is needed to reduce demand and interrupt supply through the seizure of shipments, assets and proceeds. Help must also be offered to local communities to provide alternative livelihoods, build local enterprises and to empower communities to live in harmony with their surroundings. The future of wildlife is in our hands, but if we are to be successful against the criminals those hands must be joined in proud partnership and close cooperation." "The current wildlife crisis is not a natural phenomenon – unlike a drought, a flood or a cyclone. It is the direct result of people’s actions. People are the cause of this serious threat to wildlife and people must be the solution, which also requires us to tackle human greed, ignorance and indifference. Today we are seeing a global collective effort to end wildlife trafficking. Across every continent governments and citizens are tackling both demand and supply – making wildlife crime much riskier and far less profitable." 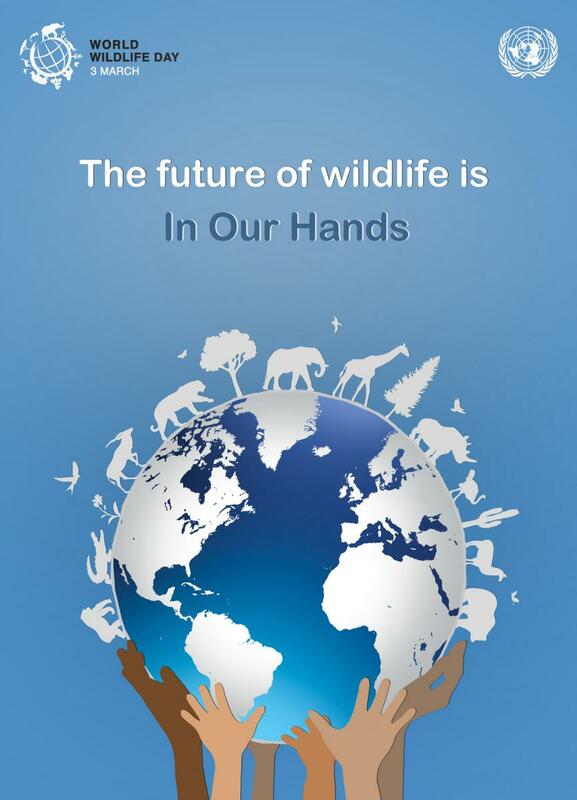 "World Wildlife Day this year reminds us of the power and privilege we have as humans to care for the special and unique wildlife that inhabits our planet with the theme ‘The Future of Wildlife is in Our Hands’. "The outcome is in OUR hands and I ask everyone to stand up and move towards action. This means different things to different people - but essentially, we have to have no poaching, buying, gift-giving or selling of illegal wildlife products, anywhere. " On 20 December 2013, the sixty-eighth session of the United Nations General Assembly proclaimed March 3, the day of the adoption of the Convention on International Trade in Endangered Species of Wild Fauna and Flora (CITES), as UN World Wildlife Day. This special day provides the ideal opportunity to celebrate the many beautiful and varied forms of wild fauna and flora, recall the privileged interactions between wildlife and populations across the globe, and raise awareness of the urgent need to step up the fight against wildlife crime, which has wide-ranging economic, environmental and social impacts. Established in 1997 through a merger between the United Nations Drug Control Programme and the Centre for International Crime Prevention, UNODC is a global leader in the fight against illicit drugs and international crime, operating in all regions of the world through an extensive network of field offices. UNODC is mandated to assist Member States in their struggle against illicit drugs, crime and terrorism. In the Millennium Declaration, Member States also resolved to intensify efforts to fight transnational crime in all its dimensions, to implement the commitment to counter the world drug problem and to take concerted action against international terrorism. CITES - the Convention on International Trade in Endangered Species of Wild Fauna and Flora - is an international agreement between governments. With 182 Parties, CITES remains one of the world's most powerful tools for biodiversity conservation through the regulation of international trade in wild fauna and flora. Thousands of species are internationally traded and used by people in their daily lives for food, housing, health care, ecotourism, cosmetics or fashion. CITES regulates international trade in over 35,000 species of plants and animals, including their products and derivatives, ensuring their survival in the wild through strictly regulating legal trade and combating illegal trade.